We take a silly look at solving the problem of fragmented product data and processes with a mythical integration product called FlōSēl. Then we get down to business with Tech-Clarity’s Jim Brown and CIMdata’s Stan Przybylinski discussing the reasons people customize their PLM systems, the potential downfalls of doing it, and the changing customization / configuration scenario given recent software architecture changes like web services and the Cloud. 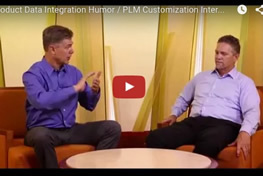 Next Episode: How do you tell true cloud PLM software versus other SaaS options and why is it important? We start this episode by poking some fun at old software disguised as cloud. Then, Jim Brown interviews Excellims Corporation’s VP of Engineering Mark Osgood who shares his experience outgrowing spreadsheets for managing product lifecycles, finding PLM systems cost prohibitive, and then implementing a “cloud” PLM solution that wasn’t truly cloud, with poor results. Then hes implemented a native cloud PLM solution. The differences in performance is dramatic.